What is your Myers-Briggs type? Honestly, I don't put all that much stock in any version of the Myers-Briggs type inventory. The official version is probably OK (I've never paid the cash to take it). But a lot of the online versions are -- well, let's call them "highly variable in quality." Rather than accepting at face value whatever one of these surveys says you are, there's an easier and better way: just read the descriptions of the 16 types and decide for yourself which of them seems to be the pattern that's closest to who you think you actually are. If that aligns with one or more of the survey results, great; if not, then I'd put more emphasis on the written description, bearing in mind that individual human beings are individuals -- you may or may not be a close match with one of the 16 typical patterns of aggregate behavior. Another great resource is the Oddly Developed Types site. Don't be put off by the name; this site is not only clearly and succinctly written, it's also very funny. Be sure to check out the author's cartoons as well, as some of them communicate the real nature of each type and temperament better than a lot of words can. Flatfingers wrote: Honestly, I don't put all that much stock in any version of the Myers-Briggs type inventory. The official version is probably OK (I've never paid the cash to take it). I take the test, see what it gives me, and then see if I agree with the result. Sometimes simply doing the questions can help make you think about who you really are. Wow, I can't believe I missed this thread! The thing with Meyers Briggs, is that everyone will occasionally exhibit the traits of other personality types. A classic example of this is that an introvert may feel the need to be around large groups of people from time to time. The test is just to give a sense of the balance between overarching types. I, for example am an INTJ, but my test showed that I almost fell into the INTP category. How do we find out which one we are?? IronDuke wrote: How do we find out which one we are?? Google "Myers-Briggs test". It should come up with some good results. I am literally and wholly in love with myself. Jazehiah wrote: The thing with Meyers Briggs, is that everyone will occasionally exhibit the traits of other personality types. A classic example of this is that an introvert may feel the need to be around large groups of people from time to time. The test is just to give a sense of the balance between overarching types. One of the most common popular objections to the Myers-Briggs types, as well as the Keirsey Temperaments, runs something like this: "I've taken the tests, and read the descriptions, and I don't fit into any one of them." 1. Personality is more than just character (i.e., a predisposition to particular psychological motivations). It's also about habits, which are learned behaviors. Human nature, generally and individually, is far too complex for any model of personality to describe perfectly. That doesn't mean some aren't demonstrably better than others; it just means no one should put too much stock in what any "personality test" says about them. Even the best systems have some slop. But to say this another way: behaviors are what you see people do, and are also affected by learned habits; motivations are why people usually prefer certain kinds of behaviors. The types and temperaments assess motivations, not behaviors. So it's fair to say that different people can express the same behaviors. But it's less accurate to suggest that the MB types (or, more clearly, the four temperaments) are similar to each other, because those are descriptions for visibly different (and probably biochemically driven) patterns of motivational preferences -- the why behind what people do. 2. The sixteen MB types and the four temperaments are patterns generated from analyzing large volumes of self-reported data about human motivations. But you are not a pattern! You're a person -- an actual, individual human being. If your personal style doesn't perfectly match one of the patterns in some psychological model, that doesn't mean there's something wrong with you, nor does it mean you're a special snowflake who is completely unlike anyone else, nor does it mean that you've proven that model to be bogus. It may be that, for some reason, your learned habits were particularly strong the day you took the test, and they overrode the innate motivations that the test was constructed to measure. Or, if it was one of the many online tests (as opposed to the official Myers-Briggs Type Indicator survey instrument), it might have been a badly-worded piece of junk from someone with more enthusiasm than understanding of the patterns. Or it might mean that your personal way of seeing the world is more complex than what most personality style assessment tools are capable of describing. 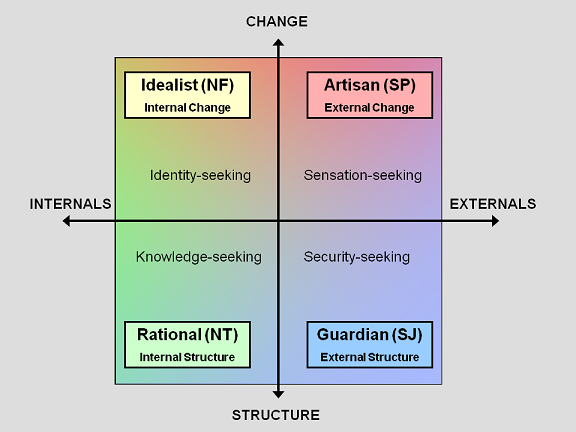 For example, in my model, as shown above, NF Idealists and SJ Guardians are opposites. An SJ Guardian may not like a particular free-spirited SP Artisan, but they'll at least speak the same language about what's important (that being "reality"). And an SJ Guardian (particularly one who prefers Thinking over Feeling) will share an appreciation for organizing the world that NT Rational enjoys. But put the pattern-typical NF Idealist and SJ Guardian in a room together, and be prepared to have to run back in to peel their hands off of each other's throat. The security-seeking, materialist, hierarchy-favoring Guardian traditionalist and the identity-seeking, abstract, consensus-favoring Idealist radical will only in the rarest cases understand each other, value the other's style, appreciate the other's gifts, or even tolerate the other's very existence. Not all types/temperaments exhibit the traits of other types/temperaments! 1. Find a source for the official Myers-Briggs Type Indicator and pony up the cash to get assessed. Most of these folks actually are professional in helping you make sure your assessment is accurate, since they paid even more cash to get accredited. 2. Take one of the many, many, many online assessments. My advice would be the Keirsey Temperament Sorter from the late David Keirsey's site (now run by his son), http://www.keirsey.com/ . Not only will you get their read on your Myers-Briggs type (and David Keirsey's descriptions of the sixteen patterns of type are outstanding), it'll also explain which of the four temperaments is probably your most natural core motivation. 3. Buy a copy of David Keirsey's book, Please Understand Me II, and just read the descriptions of the patterns to see which one seems to describe you -- the person you know you really are -- the best. A "test" is not necessary; it's just a tool. What matters is recognizing your normal preferred motivational pattern... and you can do that just fine for yourself by simply reading the descriptions and realizing which one (or two if that's how you're wired) sounds most like you. You can always take some of the online tests later if you'd like to see whether they confirm your self-description. I think most of us used the test linked in the previous thread about this. I guess I sit right on the "Structure" line in your model, then, considering I'm basically IxTJ. However I am pleased to note that the weaknesses the site stated are... weak. I've always known what my problems are and have been rooting them out for a long time. The strengths, on the other hand, are very much there.